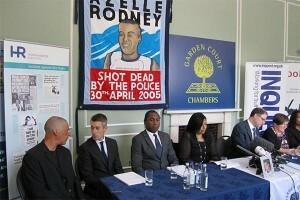 Azelle Rodney was shot dead by a Metropolitan Police officer on 30 April 2005. Today, in a historic report, Sir Christopher Holland, the Chairman of the Azelle Rodney Inquiry, found that the death of Azelle Rodney was unlawful. Further, he found that there was no legal basis provided by criminal law to justify the action of the officer. Sir Christopher Holland also found a number serious defects and failures in the risk assessment and planning of this pre-planned firearms operation. The Chairman said there was a lack of 'threat and risk assessment' by the police and this had an impact on the death (paragraph 24.42). Had there been a threat and risk assessment this would have given the police 'focused better-informed attention' in arresting Azelle Rodney earlier in the day perhaps in the Harlesden area (paragraph 24.43). "In the course of cross-examination, Mr Thomas on behalf of Ms Alexander challenged the tactics for the later stages of Operation Tayport as directed by Silver. His contention, in short, was that it was in Harlesden that the suspects should have been arrested and their weapons seized. Had the tactics provided for this then the probabilities were that Azelle Rodney's life would have been spared. Initially this line of argument had little appeal. As it seemed to me, I was being invited to exercise hindsight in a pressure-free environment as to decisions made eight years ago when under pressure and, as it were, 'on the hoof'. However, by the conclusion of oral submissions, I was persuaded that the adopted tactics were at least open to comment by me and to appraisal in the course of the recommended review, perhaps so as to contribute to future training exercises for Silver Commanders." The inquiry into Azelle Rodney's death was the first public inquiry which was set up to replace an inquest into a death in police custody. This was due to the fact that there was secret evidence which an ordinary Coroner would not have been allowed to see. Never before has there been such a clear and unequivocal finding in a fatal case of wrongdoing by a state agent (police officer) in the line of his duty. This case has made history. "This is truly a great day for Azelle's mother, Susan Alexander. She is an incredibly brave and determined woman. It is bad enough losing a child, but when your son is lost in circumstances such as these it makes that loss all the worse. Susan Alexander has had to wait over eight very long years through no fault of her own to get justice for her son. I am just very privileged to have been a part of the legal team to help her achieve this. I wish to pay tribute to the fantastic legal team that I was part of, including Daniel Machover and Helen Stone of Hickman Rose solicitors, my junior Adam Straw of Tooks Chambers, and also Isabelle Maguire, Allison Bailey and my pupil Ifeanyi Odogwu, all of Garden Court Chambers." Susan Alexander, Daniel Machover and Helen Shaw, co-director of INQUEST responded to the report at a press conference held at Garden Court Chambers. Their statements are reproduced on the INQUEST website. The Report of The Azelle Rodney Inquiry is available from the Azelle Rodney Inquiry website, together with an Executive Summary. The Inquiry website also has copies of transcripts of its hearings. The case has been widely reported, including by the BBC, Channel 4 News, Sky News, The Guardian, The Independent, The Daily Mail, LBC radio and the London Evening Standard. Leslie Thomas has been defending civil liberties for over 25 years. He is a member of the Garden Court Claims Against the Police and Inquests Teams. For media enquiries, please contact Ben Walker, tel: 020 7993 7671.